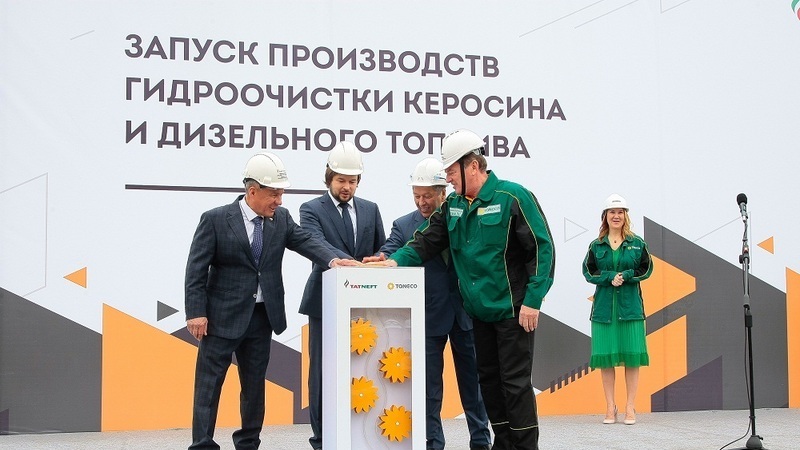 Today, the launching of two new facilities for hydrotreatment of kerosene and diesel fuel was held at the oil refinery complex of "Tatneft" - "TANECO" company. Deputy Minister of Energy of the Russian Federation Pavel Sorokin, Tatarstan’s President Rustam Minnikhanov, Aide to Tatarstan President Rinat Sabirov, Director General of JSC "Tatneft" Nail Maganov, Director General of TANECO Leonid Alekhin and Licensing Sales Director of Russia and CIS of Shell Global Solutions company Yulia Zaeva took part in the ceremony. According to the President of Tatarstan, refining capacity of a new technological generation with maximum processing depth have been established at the Nizhnekamsk industrial site. Deputy Minister of Energy of the Russian Federation Pavel Sorokin noted that "Tatneft" and "TANECO" set a good example to the other teams of Russia. "Tatarstan has gained a good experience in the field of export substitution, created a unique database of competencies, which will form the basis for further development of the country", - he noted. The Director General of JSC "Tatneft" Nail Maganov thanked federal and regional authorities and the Ministry of Energy of the Russian Federation for the support in the implementation of the TANECO project. He added that today, the TANECO is a leader of the Russian oil refining industry, strengthening economic stability of our country. New facilities for hydrotreatment of kerosene and diesel fuel will allow to increase the output of products with high added value. The capacity of installations for hydrotreatment of kerosene and diesel fuel for raw materials is 500 thousand tons and 1,6 million tons per year respectively. In addition, it will be possible to increase the production of aviation kerosene of marks RT, TS-1, Jet A-1up to 950 thousand tons and diesel fuel "Euro-5" up to 3 million tons per year. In total, during the project implementation, 307 billion roubles were invested into the project. Over 80 high-tech jobs have been organized for new installations. Today, TANECO's refineries are fully loaded. The complex produced 8.5 million tons of oil products in 2017. The processing depth exceeded 99.2% and output of light oil products reached over 87.5%.